I am a recent graduate, from Scotland, with a BSc in Marine Biology from the University of St Andrews. My aim is to pursue a career in cetacean research, for which extensive fieldwork experience will be essential. I have always had a keen interest in the marine environment, which was increased by my studies at university. I have previously gained practical experience in marine mammal research from assisting PhD students with their research. During my time at university, this included helping with the data collection on projects concerned with seal diet around Scotland and seal vocalisations. 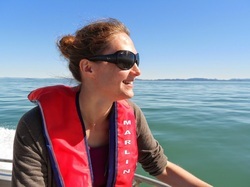 Immediately before joining the Capricorn Cetaceans team, I was in New Zealand working as a research assistant on the Hauraki Gulf Common Dolphin Catalogue Project. The aim of this project was to create a catalogue of common dolphins in the gulf in order to assess site fidelity, abundance and social structure of this species. Through this project I gained experience in photo-ID techniques, and was able to see for the first time some amazing marine mammal species, such as orca, bottlenose dolphins and Bryde’s whales. locations on the north-east coast of Australia.